The Funky Felter: Come feel the felted goodness in person! 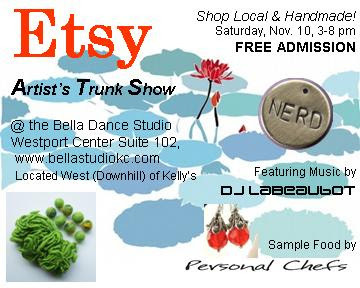 KCEtsy Trunk Show this Saturday! Come feel the felted goodness in person! KCEtsy Trunk Show this Saturday! Don't miss out on some fuzzy felted goodies at the Kansas City Etsy Street Team’s Artist Trunk Show. Come buy some holiday gifts (or some goodies all for yourself) at this local KC area indie arts fair. Browse and buy unique, quality, handcrafted items and support your local artists and crafters! Shop local and shop handmade from local artists and handcrafters in the Kansas City Area who sell their wares on www.etsy.com. A wide range of high quality, unique, handcrafted items will be available. Here is just a glimpse at what this show will have to offer. Amazing wool felt creations; stunning mixed media and digital art; beautiful ornaments, stationary and pendants using vintage art; chic handmade wearables; classic accessories for babes and tots, and much, much more! During the show enjoy music by DJ Labeaugot, and sample foods by Personal Chefs. For a list of all our local Etsy artists, visit our KCEtsy blog. View pictures of our recent work at our KCEtsy Flickr group. Text description of show contributed by member of KCEtsy - tinystitches.etsy.com.